What a great trip! I’m loving British Columbia! The landscape is beautiful and the wines are too! 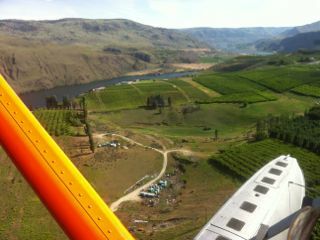 So after a great adventure from Seattle via Lake Chelan that included a flight on a seaplane (where poor 1000 Corks got sick!) and lots of delicious wine (a blog post is brewing on that! ), I made it to Penticton, British Columbia to the 6th annual Wine Bloggers Conference! Because our bus was several hours late and delayed at the border for an hour, we missed the first event featuring the sponsors and so the conference proper kicked off for me last night at scenic See Ya Later Ranch high above the north end of Lake Chelan for the Constellations tasting of wines of Okanagan. ← From SeaTac to Lake Chelan: it’s time for WBC13!